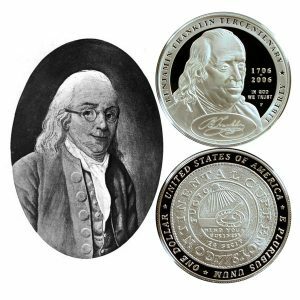 Today, the Franklin Founding Father Commemorative Silver Dollar Coin remembers a letter the gentleman wrote on September 11, 1783. To Josiah Quincy Passy, 11 September, 1783. My Dear Friend: — Mr. Storer told me, not long since, that you complained of my not writing to you. You had reason, for I find among your letters to me two unanswered. The truth is, I have had too much business to do for the public, and too little help allowed me, so that it became impossible for me to keep up my private correspondences. I promised myself more leisure when the definitive treaty of peace should be concluded. But that it seems is to be followed by a treaty of commerce, which will probably take up a good deal of time, and require much attention. I seize this little interim to sit down and have a little chat with my friends in America. I lament with you the many mischiefs, the injustice, the corruption of manners, etc., that attended a depreciating currency. It is some consolation to me, that I washed my hands of that evil by predicting it in Congress, and proposing means that would have been effectual to prevent it, if they had been adopted. Subsequent operations, that I have executed, demonstrate that my plan was practicable; but it was unfortunately rejected. Considering all our mistakes and mismanagements, it is wonderful we have finished our affairs so well, and so soon. Mr. Storer, whom you recommended to me, is now in England. He needed none of the advice you desired me to give him. His behavior here was unexceptionable, and he gained the esteem of all that knew him. The epitaph on my dear and much esteemed young friend, is too well written to be capable of improvement by any corrections of mine. Your moderation appears in it, since the natural affection of a parent has not induced you to exaggerate his virtues. I shall always mourn his loss with you, a loss not easily made up to his country. How differently constituted was his noble and generous mind from that of the miserable calumniators you mention. Having plenty of merit in himself, he was not jealous of the appearance of merit in others, but did justice to their characters with as much pleasure as these people do injury. It is now near two years since your friendship induced you to acquaint me with some of their accusations. I guessed easily at the quarter from whence they came; but, conscious of my innocence, and unwilling to disturb public operations by private resentment or contentions, I passed them over in silence; and I have not, till within these few days, taken the least step towards my vindication. Informed that the practice of abusing me continues, and that some heavy charges are lately made against me, respecting my conduct in the treaty, written from Paris and propagated among you, I have demanded of all my colleagues that they do me justice, and I have no doubt of receiving it from each of them. I did not think it necessary to justify myself to you by answering the calumnies you mentioned. I knew you did not believe them. It was improbable that I should at this distance combine with anybody to urge the redemption of the paper on those unjust terms, having no interest in such redemption. It was impossible that I should have traded with the public money, since I had not traded with any money, either separately or jointly with any other person, directly or indirectly, to the value of a shilling since my being in France. And the fishery, which it was said I had relinquished, had not then come in question, nor had I ever dropped a syllable to that purpose in word or writing, but was always firm in this principle, that, having had a common right with the English to the fisheries while connected with that nation; and having contributed equally with our blood and treasure in conquering what had been gained from the French, we had an undoubted right, in breaking up our partnership, to a fair division. As to the two charges of age and weakness, I must confess the first, but I am not quite so clear in the latter; and perhaps my adversaries may find that they presumed a little too much upon it, when they ventured to attack me. But enough of these petty personalities. I quit them to rejoice with you in the peace God has blessed us with, and in the prosperity it gives us a prospect of. The definitive treaty was signed the 3d instant. We are now friends with England and with all mankind. May we never see another war, for in my opinion there never was a good war or a bad peace. The Franklin Founding Father Commemorative Silver Dollar Coin shows with an image of his portrait from the painting by Mrs. Oliver Champlain.